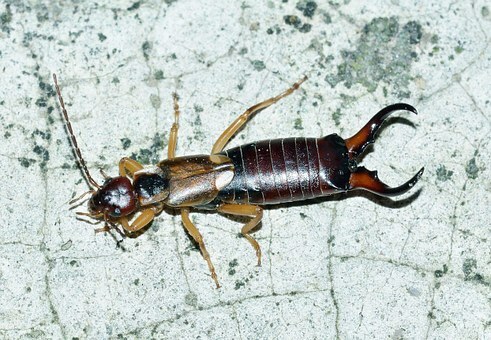 Earwigs are dreaded by many people. 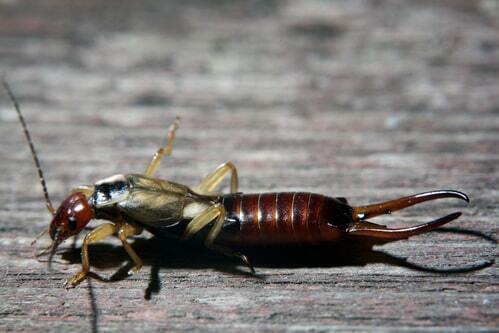 Long ago, people thought earwigs crept into people’s ears during sleep and caused insanity. This was the origin of the name “ear wiggler.” While this theory was proven nonsensical, the fear of earwigs has persisted. In the garden, earwigs actually provide benefits because they feed on other pests like larvae. But when a large number of them congregate or start entering houses, they become a problem. Earwigs have long, dark red bodies, yellow legs, and a powerful-looking pincer at the end of the thorax. They have yellow wings but don’t often use them. Female adults have small antennae while the males’ are large and curved. Adults can grow to 16 mm. 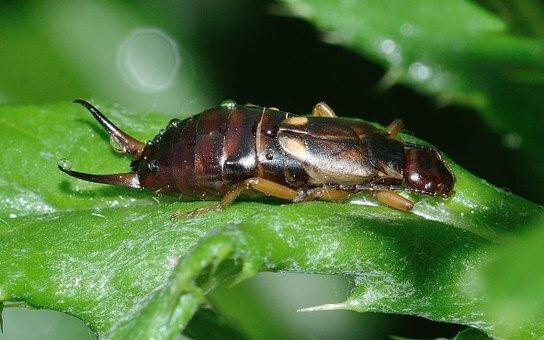 Earwigs eat live and dead pests like spiders, larvae, aphids, and even other earwigs. They also eat plants, flowers and leaves. They come out at night to feed, and in the daytime, they hide in dark, moist areas. In the garden, they can be found under stones, wet leaves, and tree branches. Inside houses, they find shelter under the floor or in cracks in the walls. 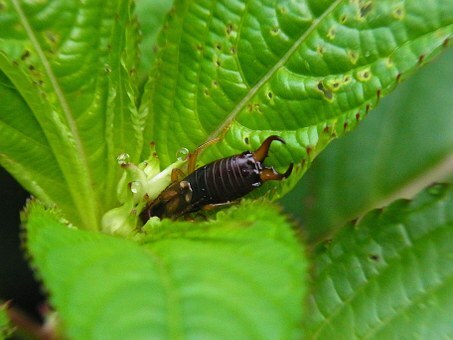 Because earwigs eat vegetation, a large number of them in your garden can gradually destroy trees and plants. Although they don’t bite humans, when they’re disturbed they can pinch with their pincer. This isn’t venomous and only produces a scratch, but it’s important to wash the area in case the earwig carried germs from the soil. Some species of earwigs also secrete a smelly liquid when they’re threatened. In general, earwigs stay outdoors but if the weather is dry or hot, they may venture inside homes. Earwigs discharge an odour that attracts others of their kind, so if you find one or two earwigs in your home, they can lead others inside. Likely hiding places are dark areas with moisture like the basement, crevices in the walls and floors, and garbage. Earwigs are first drawn to your yard. Mounds of dead leaves, branches, wood, and stones are ideal habitats for them, so rake and sweep your garden regularly and keep it free of garbage. These insects also look for moisture. Clean wet areas like gutters, faucets, and underneath air conditioners; make repairs to cracks and leaks. Block earwigs from entering your house by sealing cracks in the walls, windows, and doors. Recognize earwigs and prevent them invading your home and garden by taking these simple steps. If you think you have an infestation, seek professional help. JDM Pest Control in Richmond Hill and Vaughan can assess the situation and eliminate the problem for you. Call us at (416) 729-3568.